Bill Hobby has spent most of his life in and around Texas government, including a record eighteen years as the state’s lieutenant governor. 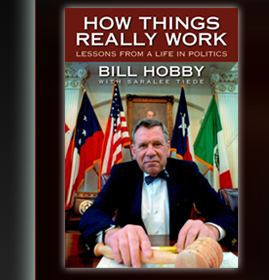 His candid recollections about his days in office, as well as his take on what state government should and should not do, are part of his new book, How Things Really Work: Lessons from a Life in Politics, published by the Dolph Briscoe Center for American History and distributed by the Texas A&M University Press. “Nostalgia is not my purpose,” Hobby writes in the book’s preface. “But I do hope to convey something of my admiration for the people that I had the honor to work with, the spirit of the times, and a sense of how things actually worked—at least in the legislative process.” His no-holds-barred opinions about everything from partisan politics to efforts to rewrite the Texas Constitution to government wiretaps and the war on drugs are included, as are his memories of working with Texas politicians Ben Ramsey, Dolph Briscoe, Bill Clements, and Ann Richards.